Melissa Cole in front of her \"River Dance,\" now on display at the JACC. One envisions pushpins on Melissa Cole’s map. London, Hong Kong, India and the western United States. She’s lived in these places. Then there’s Australia, South Africa, Galapagos, Indonesia — just a few spots she’s visited. Zooming in a bit... Florida, California, Alaska, Oregon, Washington, and Idaho, where her artwork is regularly exhibited. Closer still... Lewiston and Post Falls, two Idaho locations where the artist is simultaneously working on a large-scale outdoor installation and an exhibition accompanied by a small-scale installation. You might say she’s all over the place. “I just love traveling to see how different cultures live and to be able to observe animals in their natural habitat,” says Cole, who has a degree in zoology and marine ecology from Oregon State University. It was while working as a naturalist guide in Baja, Mexico, that Cole met her husband Brandon, a renowned wildlife and underwater photographer to whom she’s been married 17 years. She mistook him for a game fisherman, then discovered his ice chest was a ruse to foil would-be thieves; his real mission was photographing whales. The pair teamed up on children’s books that pair his photography and her writing, with titles like Wild Marine Habitats - Tide Pools and The Manatee. She went on to write 30 books in three years. Nature. Culture. Travel. Everything’s connected in Melissa Cole’s world, revealing itself in glorious patterns and surfaces. Her mother, whose realistic paintings can be viewed at Portland’s Attic Gallery, came from an artistic family and always encouraged Melissa to make art, but it wasn’t until 1998 that Cole committed to painting. At the time, Cole was interested in aboriginal paintings, yet didn’t want to mimic the indigenous style. She turned to patterns found in nature like fish scales and feathers. “Creating patterns with dots and dashes is very meditative, and I find it adds interesting dimension and movement to a painting,” she says. Although she started with watercolor, she switched to acrylic, which allowed her to create her own “frame” through an intricately painted border. Cole has done numerous private and public commissions in paint, mosaic, murals and other media — at least 50 in 1998 alone — including for Seattle’s aquarium and Lewiston’s Fifth Street pedestrian bridge. Scheduled for early June completion, the bridge features a 100-foot mosaic snake, not unlike the 23-foot anaconda Cole encountered in Brazil last year. Other wildlife pieces include bears, birds, moose, otters and fish, especially salmon, like those in “River Dance” inside Spokane’s Convention Center. 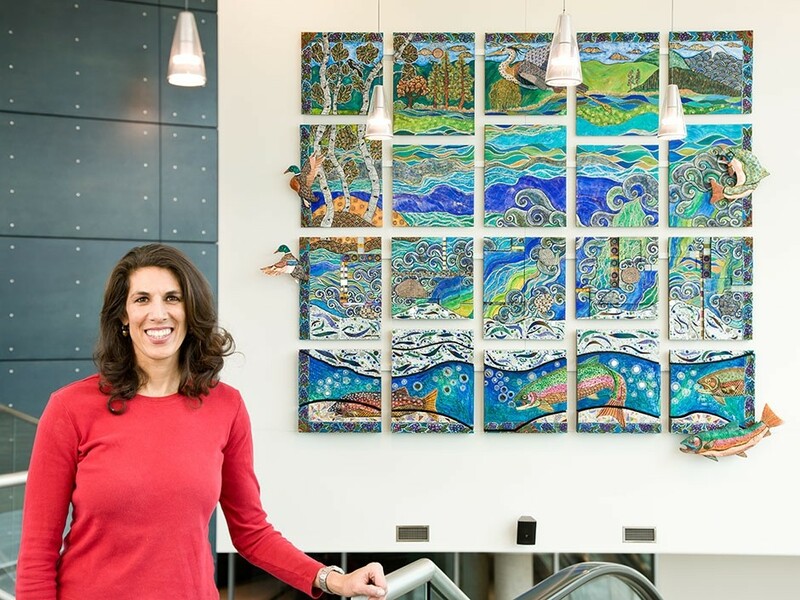 Cole’s new exhibition at the Jacklin Arts & Cultural Center also features salmon in a custom mosaic. Entitled “Onward and Upward” and sponsored by the Coeur d’Alene Tribe, the permanent artwork will feature a Kokanee salmon. The piece is meant to honor JACC founder and avid fisherwoman Susan Jacklin.